Welcome to Living On A Narrowboat and your guide to every one of the narrowboat friendly canal marinas in England and Wales. You’ve probably found this page through a search engine as there are no internal links to it, so what’s the site all about? You can read a site introduction here. The site started off as a useful source of information for anyone wanting to do as I do and live full time on a narrowboat. Purists will tell you that I am not a “proper” narrowboater because I moor in a marina’s manufactured environment with all the facilities on tap. They may be right but, let me tell you, in January this year with daytime temperatures below freezing for days on end and three inches of ice on the canal, having an unlimited supply of electricity and running water was very handy. Purists will tell you that they have the freedom to travel where they want, when they want without having to leave a mooring that they are still paying for. If they have the luxury to be able to travel for months on end without having to worry about work, I envy them. 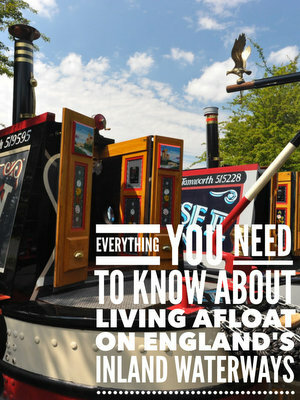 I don’t have that luxury, nor do most other narrowboat owners who live on board. The alternative to a secure marina mooring off the canal is what is known as an online mooring. An online mooring is simply a designated long term mooring spot along the side of the canal. This mooring may or may not have access to water and electricity in which case you will need to run your boat’s engine for several hours a day to charge your batteries to provide enough electricity (difficult if you have to go out to work for most of the day) and take your boat to the nearest water point at least once a week to top up. The alternative to moving your boat to resupply with water is to bring the water to your boat. You’ll probably go off that idea though after your first trip along a muddy, wet and cold towpath with an unwieldy 25l container in your hand. Another downside to canal-side moorings is security. Most moorings are on the towpath side of the canal. Towpaths are public footpaths. Anyone can use them. The vast majority use them to enjoy a walk along the canal. Occasionally they are used by the not so well intentioned for access to your easy to break into boat. Canal marinas are very much more secure as they are often away from public roads and away from the towpath. Marinas on the offside (opposite side to the towpath) have fewer problems than those next to the towpath. The security where I live is excellent. Road access is along a half-mile private drive and then through a gate (locked between 6pm and 6am every day) onto the site. Access to the site from the canal is only achievable by walking over a lock gate. It’s not tempting if you’re up to no good. Another consideration before deciding between online moorings and marinas is how you transport anything to your boat. If you have a solid fuel stove you will need wood and/or coal. I use coal. In the winter I use 2-3 25kg bags each week. I use a 13kg cylinder of Propane gas each month and I have to eat and drink. It’s all heavy stuff if you have to manhandle it several hundred metres from where you’ve parked your car by the nearest canal bridge. I park my car forty feet from my boat so I have no problem. A long term on line mooring will cost you up to £1,500 a year (much more anywhere near London). A marina mooring will cost up to £2,500 (again, more near London). If you are tempted by the relative luxury of a canal marina mooring, there’s a full list here. If you’d rather see a map with all of the marinas pinpointed click here. If you want to search for a marina by the river or canal that they are on, select “marinas by waterway” from the menu above.